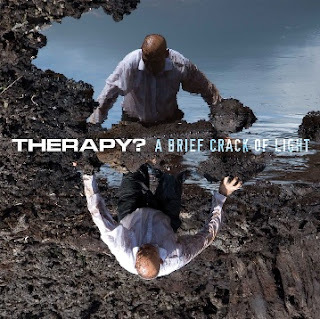 In over twenty years the indestructible metal band Therapy? filled up twelve albums. Fronted by Andy Cairns the band managed to come over some rough years. After a commercial height halfway the nineties, the problems started. They ended up without record label and some members left the band. But Cairns and bass player Michael McKeegan, both in the band from the beginning, didn't give up. Meanwhile things quiet down again and they played their hit album Troublegum to a sold out Melkweg in 2010, to celebrate their 20th anniversary. Without slowing down the kind Northern-Irish continue with album number thirteen, A Brief Crack Of Light. And that turned into an interesting album, although with only ten tracks a bit short. Heavy, loud and passionately played songs are alternated with melodious, modestly played songs and lyrics that thoroughly avoid the metal clichés. And with that they stay loyal to their own sound, which is more than just metal. Of course still with Cairns' familiar guitar riffs, the steady heavy bass sound of McKeegan, and the solid, a bit tinny drums of Neil Cooper, who has been sitting on the drum throne since 2004. That also means, that the band are doing more than just racing straight on. There's enough room for peace and quietness. Although they are kicking off hard with 'Living In The Shadow Of A Terrible Thing' and 'Plague Bell', where especially the last song takes you like a stampede. But then the instrumental 'Marlow' follows which is more of a grungy, even swinging guitar track. They manage to keep up this variation throughout the album. Striking are the scarce vocals in some of the songs. Like they want to emphasize the music and let it speak for itself. The album closes with the strange 'Ecclesiastes', that sounds more like a kind of soundscape, with distorted vocals and guitars that keep on simmering instead of spewing fire. It feels a bit out of place, but at the same time it doesn't. It's characteristic for this record that feels like a true Therapy? record, but simultaneously has been put together with courage and enough room for experiment. After their golden years the band may have been underneath the radar, which is not necessarily a bad thing. They seem to do well and feel comfortable there. They should be able to keep this up for many years to come. Let's hope so! Listen to 'A Brief Crack Of Light' on Spotify. Labels: album review, alternative, metal, rock, therapy?